The arches facing Glynne Way to the east of the Glynne Arms were the entrances to the shambles – where butchers cut up animals and sold meat. Look closely and you’ll spot two hooks on each side of one of the openings, probably used for hanging meat. Butchers could not trade from shops until refrigeration became widely available in the early 20th century. Hawarden’s shambles were constructed in the late 18th century, or possibly the early 19th, as accommodation for butchers on the north side of what was then the market place. The decorative brick arches were installed later in the 19th century. 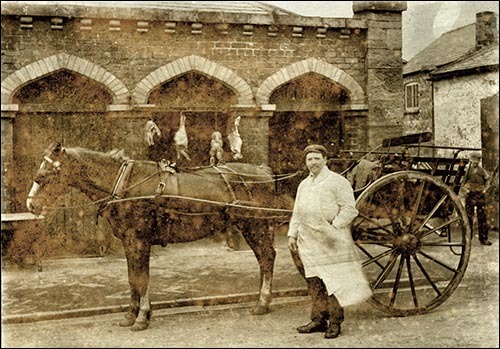 The photo on the right was taken c.1900 and depicts butcher Edward Edwards with his horse and cart outside the shambles, where meat hangs on hooks. It is shown here courtesy of Flintshire Record Office (image ref: D/DM/1511/2). Livestock markets were held behind the shambles, in the yard of the Glynne Arms. Butchers continued to sell meat here into the 20th century. One Hawarden butcher made a quick profit in 1892 when he bought the hide of a celebrity cow for £2 and immediately sold it for £5. The heifer had escaped to the woods of the Hawarden Castle estate and evaded capture for a day. William Ewart Gladstone (four-times Prime Minister) was unaware of this as he took a stroll. The cow blocked his way, so he struck it lightly – whereupon the statesman was knocked to the ground. He suffered only minor injuries but the incident was widely reported (initially as an attack by a raging bull) and later referenced in jokes by his House of Commons opponents. The cow was shot soon after the incident. The marksman sold the teeth individually and sent the head and hoofs for preservation. The head returned to Hawarden and was displayed at local hostelries for decades. In the part of the shambles which is open to the public, you can see a plaque presented by Erskine William Gladstone in 1953 to mark the coronation of Queen Elizabeth II. Benches of Hawarden oak had been installed below the plaque for waiting bus passengers.